What a lovely opportunity to get to know more of the online quilting community! Thank you so much for the invitation, Michele. Hmm, well, where to start? My name is Jennifer Rogers Ofenstein. I’m a native Texan and have been crafting my whole life. I have a B.A. in English with an Art minor from Sul Ross State University in Alpine, Texas. 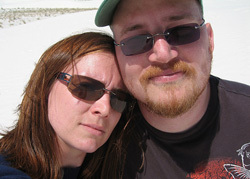 I live in Austin, Texas with my soulmate and husband of almost 15 years, Eli, and our two kids, Elena and Gareth. I’m a stay at home mom, a volunteer, a crafter and an avid paper pieced pattern designer. I learned to sew at my grandmother’s knee when I was 6 or 7 years old with her box of scraps and a giant spool of industrial thread she kept for mending. Grannie saved everything and those scraps kept me entertained for hours. My mom is a superb seamstress and quilter and was always at her machine making something when I was growing up. My Grandma also sews, making quilts for her loved ones. I guess what I’m getting at is that it’s in my blood…I never had a chance! My first sewing machine, an inexpensive starter machine, was a gift from my parents. It was my second machine, and about 8 years later when I started quilting. I volunteer for an Austin, Texas organization called The Linus Connection, previously as a board member, currently as the webmistress and a blanket maker (not affiliated with Project Linus). It’s a Central Texas non-profit that makes blankets for kids in crisis. When I first started, I was donating crocheted blankets, something I still do. The friend that got me interested in Linus found out that I made costumes, bags and clothing and was astounded I’d never tried quilting! She talked me into going to a blanket making work day at Honey Bee Quilt Store, one of Linus’ most generous sponsors, and the rest, as they say, is history! Not long after I started quilting, I discovered paper piecing. After some trial and error, and reading through several how-to books, I finally got the hang of it. The next thing I realized was that I wanted a pattern that didn’t exist, The Linus Connection Heart, needed for a thank you gift! Hmm, what to do? I sketched it out and that became my first pattern. I have been designing paper pieced patterns every since! It’s been quite a few years now and I’ve since designed hundreds of patterns, many of which are available for free on sewhooked. I’ve created How To videos and tutorials and started several online quilt groups. My main joy is sharing the love of quilting and crafting. I have spent a lot of time sharing the love and that time has been repaid over and over by the friendships I now have with quilters all over the world. After The Linus Connection Heart, the door opened. I started designing patterns in Photoshop…everything I saw was up for grabs, but especially fantasy images. One day, searching for Harry Potter fabric, a light bulb went on and I started designing HP-inspired blocks. I’ve never stopped. While I consider myself an all-around crafter, I am now primarily a paper pieced designer. My website, sewhooked, offers free paper pieced patterns, many of which are Harry Potter-insired, as well as, crochet patterns and crafty ideas. I regularly post new patterns, crafts and inspiration on my craft blog, the sewhooked blog. Making things with my hands is my therapy and I love to share my ideas. The more crafters and quilters out there, the better place I think this world will be! It took over a year and many, many hours to design and piece all the blocks. 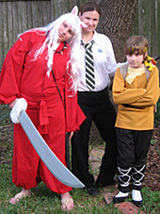 It’s been shown at Phoenix Rising, a Harry Potter fan conference in New Orleans, LA in 2007 and at The Hill Country Book Store during the July lead-up to the release of Harry Potter and the Deathly Hallows. My Magical Lens was chosen as one of The Best of Craftster 2007, was mentioned in the Threadbanger article Bring Back The Quilt and been included in the CRAFT blog Flickr Pool Weekly Roundup as well as being mentioned in several Harry Potter fan-produced podcasts. I’m formerly a Crafty Witch for The Leaky Cauldron (2006-2007), a Harry Potter fan site, and a former moderator for Harry Potter Crafts Yahoo! group. While working at The Leaky Cauldron, the other Crafty Witches and I each sent a gift to J.K. Rowling. 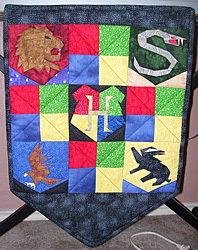 My gift, a quilted wall hanging entitled “House Unity” now, according to the amazing and much cherished thank you letter I received from Ms. Rowling, hangs in her office. 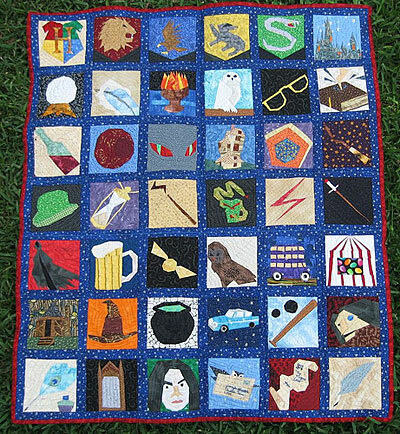 Harry Potter Paper Piecing Livejournal Group – monthly prize drawing for photo contributors! What now? I’m still crafting, quilting, volunteering for The Linus Connection, keeping up with my website and blog, being a mom and designing, designing, designing. 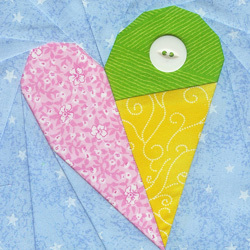 I have more big plans in the works, but until those are unveiled, you can find me on sewhooked…paper piecing my heart out! The first five people to comment will receive a “Piece, Love, Quilting” button! Nice to know a little bit more about you. Cool! There was so much I didn’t know about you yet that I learned here. I promise, I will get the hang of paper piecing, eventually. Oh Jenn I’m so happy for you. Your paper piecing is out of the world normal quilting, and to to the world of what we all love. You inspirer me to do new things in quilting and quilt outside of the box! What a fun interview. Nice to get to know you better! This is just a note to let everyone know that we are very proud of our talented daughter. She has never met a stranger or failed at anything she has tried to do. She also has proven to be a great little mother. Quilting and Crafting are not her only talents. She is also Mrs. Fix-it around the house and excellent cook. We are extremely proud of her. I love all of your patterns, I have learned alot about paper piecing from you. Thanks for being such a fantastic teacher. Jennifer you have a lot to be prowd of and I know there is more to come. I am so glad you are such a good friend. Jennifer, it was delightful to read your posting! You are very special to us in our ‘circle of five,’ and we are all proud of your accomplishments. I wish you only the best in future endeavors. Six weeks until Canyon!! Great interview from a great lady. Best of luck on your big plans. Can’t wait!